You won't necessarily realise it from the cover, which I interpreted as emphasising that Homer Simpson will still have a job when Springfield Energy converts to fusion power, but Jason Parisi and Justin Ball have packed The Future of Fusion Energy with information on the detail of how fusion reactors work, and all the difficulties that are faced in getting a stable, lasting fusion reaction going. It's not an easy task, which is why it has taken so long. The authors say in their introduction 'Despite popular conception, fusion science and technology has made remarkable progress, compared to other fast-moving fields.' Really? This is a technology that in the 1960s was expected to be providing us cheap power within 30 years. Now, 60 years later... it's still good 30 years away from the likelihood of making a serious contribution to our electricity needs. What other 'fast-moving field' has those kinds of timescales? Nonetheless, fusion is potentially highly important for the future of our energy supply. So should everyone read this book? Probably not. I suspect that it is an ideal source book either for journalists wanting to write about fusion, or students with an essay to compose. The first 260 pages provide a reference fact book on tokamak reactors. It's an excellent resource - but not a great read. There's important stuff in here on how the reactors work and don't work. 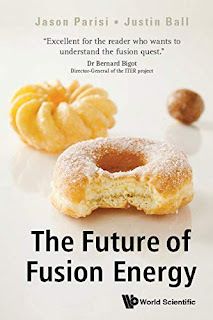 And there's a useful section on the history of fusion reactors and on the building of the next generation ITER machine. But there's no narrative to it, just fact after fact. Only in that historical/ITER part and the final section where we see alternative options for fusion do we get anything that feels like popular science. That's not to say that the fact sections aren't useful. Apart from lots of technical background, the section on ITER is salutary. This is a huge international project, which seems fraught with organisational problems. Unlike the building of the Large Hadron Collider - another huge international project that was relatively well managed (see CERN and the Higgs Boson), ITER looks like a textbook case of how not to manage a large project. One example that Parisi and Ball give is the way that parts of the reactor are being manufactured by different countries, leading to potential difficulties. As they comment about the fact that seven of the sections of the reaction vessel are being made in Europe and two in Korea: 'it caused uproar when word arrived at the ITER site that the Europeans were designing their sections to bolted together, while the South Koreans expected theirs to welded. From a project management standpoint, this boggles the mind.' Quite. As far as I'm aware the technical content of the book is fine, though there was an odd part where the authors assess alternative means of electricity generation and point out that biomass is at least 20 times less efficient at converting sun power into electricity than solar… but still seem to advocate using it. That's odd. Overall, a great source book for information on fusion, but not a great read. 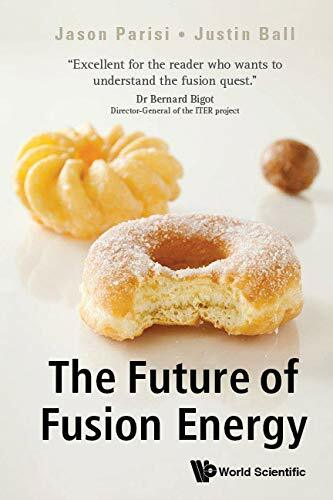 If you do persevere to the end, you will discover that the doughnuts on the cover are not a reference to Homer Simpson at all, but an obscure analogy for different means of producing fusion in the form of recipes for alternative types of sweet doughy products... though I found the analogy itself hard to follow. In a way, this sums the book up. The authors try to inject humour, which is great, but it needs much more narrative flow (and rather less detail) to work for a general reader.